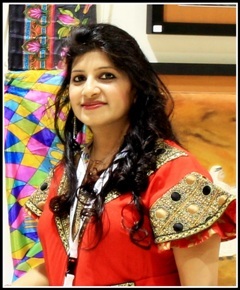 Artist Rashmi Agarwal, Founder and Chairperson of the Qatar based Art Company-MAPS International, WLL, living in the State of Qatar since 2004. She is an Art Entrepreneur , designer, Art Consultant. She is a Community Instructor in Virginia Common Wealth University-(VCU), Qatar for Silk Painting. She is the Board member of Silk Painters International- SPIN, USA. Art is her ﬁrst love. She uses all kinds of surface design techniques in her work like Dyes, Paints, block printing and materials like textile paint, ink, and fusible web. Since child- hood, she has been highly engaged in visual art. Having groomed up in an educated background with learned parents, silk painting, to her, represents meditation and very near to God and nature. She is a experienced master artist whose work gets consistently better from one painting to the next to rely on inspiration is to starve. She wants to do a timeless collection. That’s got nothing to do with the season, or get defined by trends. She is also interested in how art communities can use web tools to better promote themselves, and would be committed to building on your existing platform. She analyse every design she make to ensure it is the best it can be. Artists need to have an intuition and eye for design that cannot always be taught and to be a successful artist and designer, fashion has to be your lifestyle. She has always been motivated by the challenge of meeting a tough deadline. Over the years, Agarwal’s proficiency in multiple styles of hand-made silk painting has established her as Qatar’s foremost silk artist, attested in no small measure by the upper echelons of Qatari society and a long line of art connoisseur expats, all of who have bought her diverse works that traverse nuanced painting and calligraphy with equal ease. It’s mesmerising beyond words.” Agarwal grew up in Kolkata, racking up degrees in Economics and Finance that had nothing to do with art. Destiny rewarded her effort. She lives in Doha, the capital city of Qatar. It is the wild beauty of her surroundings that inspires her silk painting. She grew up in India and has been creative since childhood, drawings, paintings and other art activities among others. She enjoys creative adventures, including oil painting and stained glass art, a display artist, an interior designer, a copy writer, and a song writer. Painting on silk, colour and detail, are her passions. She really enjoys the freedom of the silk colours as it stimulates her imagination and offers so many exciting possibilities. She believes each has something precious and special to give to all of us and each painting is a tribute to these amazing creatures, where she strive to capture their essence. Many of the paintings she paints have a spiritual quality with the power to heal hearts and spirits, if one is open to their message. All her art says some story and she believes that good art asks more questions than it answers. And so it is often in this clash between the architecture of man and the architecture of nature , where I gain most of my artistic inspiration. It is where the most compelling questions can be asked, and where the stories I wish my art to tell can most often be found. Something that has proven itself to be truer every day of my life - "You don't choose the life of an artist - it chooses you". Think big, think fast, think ahead. Our dreams have to be bigger, our ambition higher, our commitment deeper and our efforts greater".